FILE - Demonstrators chant slogans while flashing the Oromo protest gesture during Irreecha, the thanksgiving festival of the Oromo people, in Bishoftu town, Oromia region, Ethiopia, Oct. 2, 2016. As Ethiopia's ethnic Oromo community prepares to celebrate the annual cultural festival known as Irreecha, questions linger about whether officials have learned from the deadly stampede that ruined the 2016 event. A 33-page report released Tuesday by Human Rights Watch (HRW) calls for the government to investigate the response of its security forces during last year's festival. Dozens of people were trampled as security forces fired tear gas and live rounds, according to witnesses who spoke to HRW and sources who spoke to VOA. 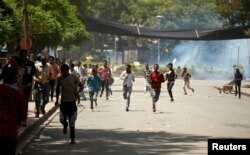 The Ethiopian government says about 55 people were killed, while opposition groups put the number as high as 700. HRW called for restraint on the part of security forces and urged the government to show preparedness leading up to the Oct. 1 event, to be held in the town of Bishoftu. "The government should take urgent steps to ensure Irreecha 2017 unfolds with far greater restraint and competence on the part of the security forces, and that effective steps are taken to minimize and de-escalate any risk of violence," HRW said. The Ethiopian government did not respond to requests for comment regarding the report. The government has expressed regret over the deaths at the 2016 festival, but also absolved its security forces, blaming the pandemonium and deaths on "anti-peace forces." The tone of Irreecha has become more political in recent years. HRW says the government was aware of that shift going into the 2016 festival. "While Irreecha is ostensibly apolitical, many regular Irreecha attendees told Human Rights Watch that recent years have not only seen increasing crowds, but also increased government involvement and increased expressions of resistance to government policies," according to the report. The Oromia region experienced anti-government protests in 2016 that led to clashes with government forces and left more than 100 people dead. Protesters at last year's Irreecha were unhappy that government representatives were present at what has historically been a cultural Oromo festival, according to HRW. In addition, the report quotes an attendee who said that local police who speak Afaan Oromo were replaced by federal security forces in 2016, heightening the tension. HRW said a smaller or lower-profile security presence might help ease tension in the crowds this year. Soldiers who do attend should be trained to respect free speech and expression, HRW said. "Security forces should expect and tolerate free expression, which may be critical of the policies of the ruling party and not use force or threat of force to silence critical speech," HRW said. Ahead of last year's festival, some young people were warned not to attend, according to the report. "The local police and some local government officials came to my school and took me and several classmates into the principal's office," one 14-year-old student from East Wollega zone told the authors of the report. "They told us not to go to Irreecha, and to tell other students not to go. They suspected we would protest the government there."